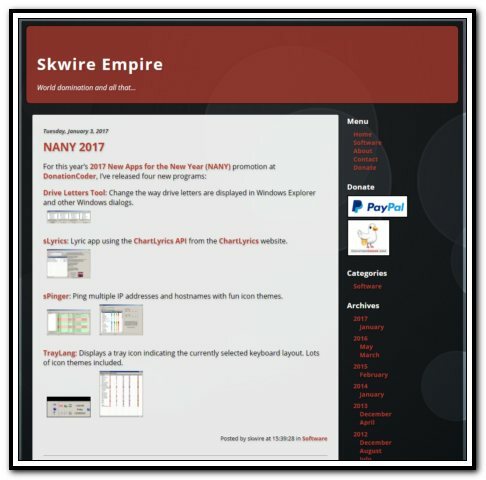 Skwire Empire is a giant collection of programs written by DC member Skwire. You'll find everything from small utilities coded in requests to posts on the Coding Snacks section of the DonationCoder forum, to full blown applications like the awesome mp3 player, Trout. One of the most prolific coders on the DonationCoder website, skwire never misses a NANY event, and rarely passes up the opportunity to fulfil a Coding Snack request. Visit skwire's new empire home: http://www.dcmembers.com/skwire. Visit skwire's section on our forum: here.